It’s the time of year that I watch my neighbor across the street pull out her roof rake and begin raking her roof. I won’t even rake my lawn, but the roof? Are you kidding? If you knew my neighbor, you might think nothing of it. This is the lady who mows her lawn every single day during summer — to keep it the right height. She also washes her driveway most every day of spring, summer, and fall. Raking the roof as a hobby just isn’t that far-fetched for this lady. But the reason she does it is different from the reasons that she mows the lawn and washes the driveway. Roof raking has an actual payoff: it cuts down on ice dams and the inherent water leaks that come with them. But roof raking is no more of a cure for ice dams than aspirin is a cure for arthritis. It stops the pain, but doesn’t treat the cause of the problem. Or so I thought until recently. 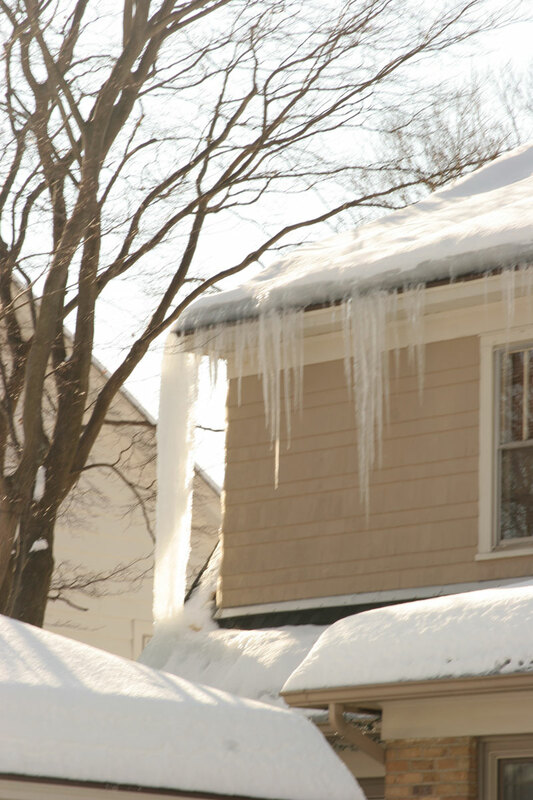 Last week while I was sifting through some video footage I learned of some interesting aspects about ice dams. 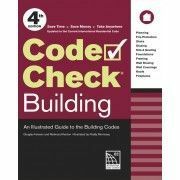 The video footage was shot last summer while I attended a a two-day class called Building Science Fundamentals taught by Joe Lstiburek and John Straube, of Building Science Corporation. 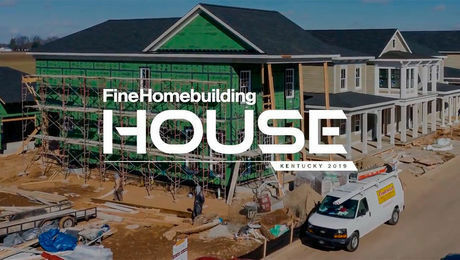 I was shooting footage of the class in hopes of turning it into a video series for Fine Homebuilding and Green Building Advisor. The segment I was watching was about roofs that had a 15 minute section on ice dams. 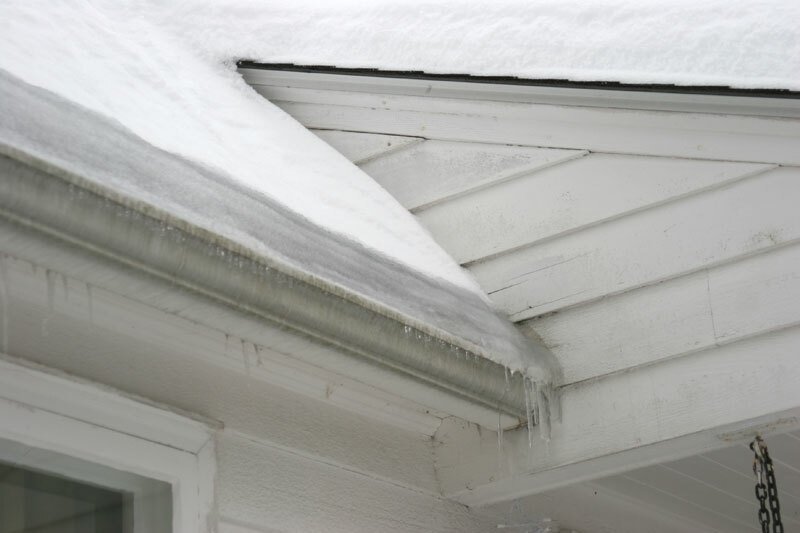 I already knew that ice dams are caused by heat escaping into an attic, warming the underside of a roof, which melts the snow. The water runs down the roof until it gets past where the exterior wall is and then it freezes — because the roof deck is no longer warm. The ice builds up and forms a dam as more water runs down onto it. Eventually the ice works its way up the roof, digging under shingles, melting, and leaking into the house. At this point, many people think they have a roof leak when they really have an air-sealing and insulation problem. 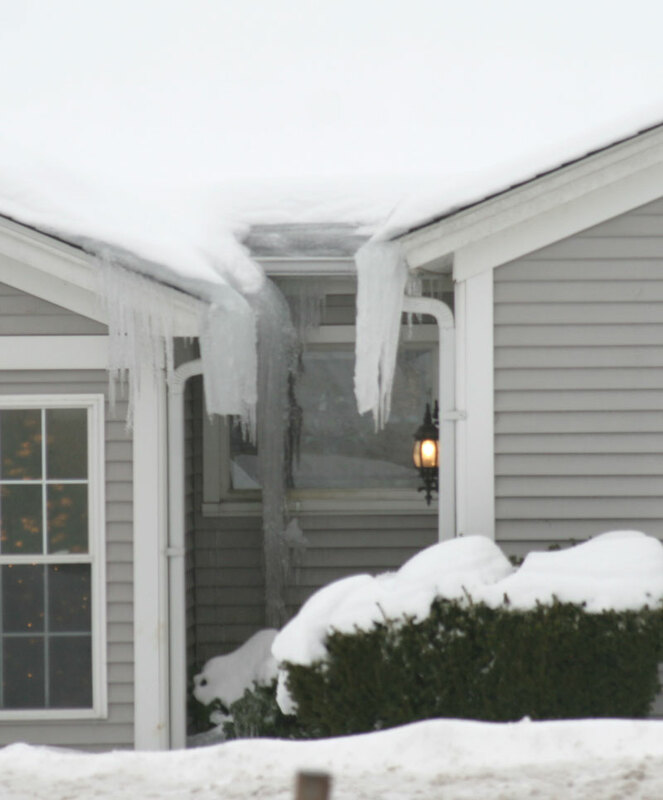 Ice dams are a bigger problem in places with lots and lots of snow. What I learned by watching the Dr. Joe’s class was that even if you have a well-insulated roof, ice dams can still be a problem in heavy snow areas; because snow is such a good insulator (~ R-0.5 to R-1 per inch). This seems counterintuitive at first, but think about it: to melt snow, the roof deck has to be above 32°F. 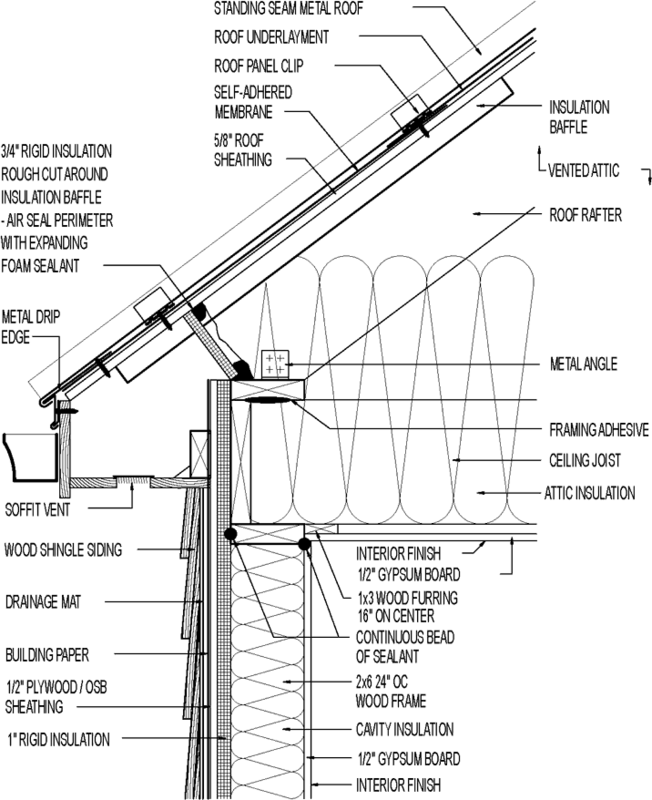 Because snow is such a good insulator, it insulates the roof deck from the outside cold air. If the roof is insulated to R-18 and there is 24 in. of snow on the roof, the deck is sandwiched between two layers of insulation: R-18 below and about R-18 above. If the temperature difference between inside and outside is 70° (0°F outside, 70°F inside), then the roof deck is most likely right in the middle, at 35°F — above the freezing temperature of water. In essence, the snow is insulating the roof enough to melt itself. Here in New England, we’ve gotten hit by a few snowstorms lately, and two feet of snow on the roof is not far-fetched at all. 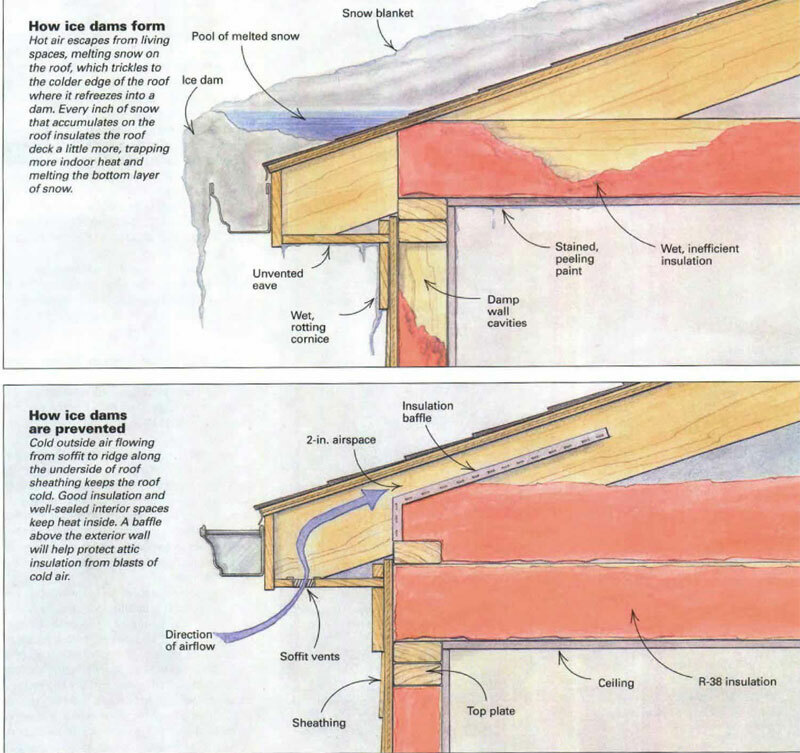 The cure to ice dams more mundane than roof rakes: insulation and air sealing in not-so-heavy snow zones, and good insulation coupled with roof venting in heavy snow zones. But you can’t rely on insulation to control ice damming in high snow areas — you need to couple it with ventilation or Australian ski bums with shovels as Dr. Joe pointed out. Roof rakes, though, do less damage than ski bums with shovels. 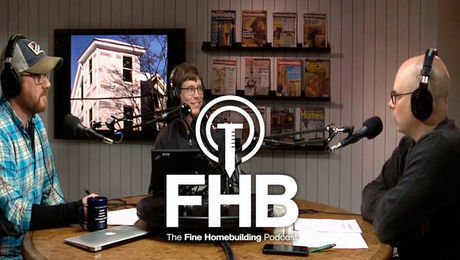 For information on how to stop heat from escaping into your attic and how to ventilate the rafter cavities, watch the video series Air Sealing an Attic with Mike Guertin. Thanks for this timely post. After a leak developed in my bedroom window two nights ago, I borrowed a colleague's roof rake and removed a 20-in. layer of snow. This morning I woke up to the sound of the alarm clock instead of dripping water. Now I have two additional New Year's resolutions: (1) buy my own roof rake, and (2) seal the leaks in my attic and add more insulation. More of the same insulation isn't always better! In a lot of cases where we can't get adequate ventilation, we'll recommend sealing off all ventilation and insulating the undersid eof the roof wityh spray foam. This is a better way to deal with unable to vent roofs or attics with ducts or heat sources in it. So, good article, but missed the option of insulating the underside of the roof to eliminate ice dams. Timely. With the snow in the Northeast and mid-Atlantic areas this year, we've been getting a lot of traffic on this topic this year. 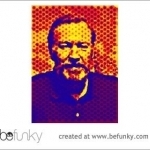 See a continuation of the discussion at http://bit.ly/eyNerU/. I'd agree with Joe that ventilation is preferred in heavy snow country--and I'd go further as argue it's preferred most times when it's architecturally practical. Belt and suspenders. However, the example you gave is a bit absurd. If you're in heavy snow country, you shouldn't have R-18 insulation!! OK, it makes the math easy. But the easy math overemphasizes the ventilation "solution". The more insulation you have (and I'm assuming that we're not talking about insulation without effective air-sealing), the more the temperature gradient at the roof deck shifts to the outside temperature. We should be talking about R-60 insulation, not R-18. Your article pretty much claims that ice dams are only caused by insulation and air flow problems. On the northern face of my house the last 2 years during the big snow storms we have had here in the Philly area the gutters on my house that have gutter guards develop a slushy, ice crust over the guards and then freeze solid due to cold night air and wind. The southern exposed gutters get warmed by the sun and don't have this problem. This issue prevents the melting snow water to escape and builds up an ice dam. When that happens the ensuing problems start to multiply. Other than raking off the snow, what options are available to help prevent this problem. 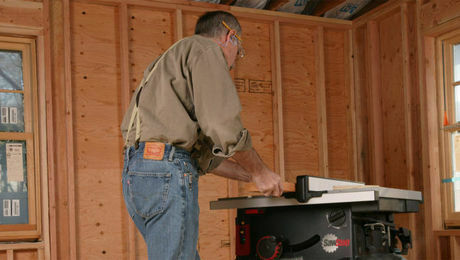 Good article, and I'm definitely a disciple of Joe Lstiburek, but I have to agree with Mike Rogers: who is going to insulate up to r-18, unless you're talking about insulating the rafter bays with batts, in which case you're screwed in this climate. But I will go one better: who's attic, no matter how poorly insulated, is 70 degrees in the dead of winter? 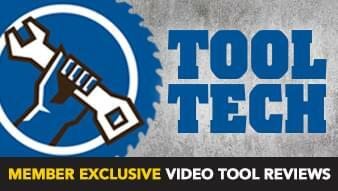 These 2 things throw a monkey wrench into the math. And buildingscience, I agree with your theory about foaming the rafter bays in lieu of ventilation, but there is only so much r-value you can get from that, and with the right amount of snow and the right temperatures, can't you still get melting problems from enough heat going through the foam but enough getting stopped from the insulating snow? I read an article where this happened and they ended up having to strip the roof, add sleepers, and install a new roof deck on top of that to create an airspace. roof vents. We couldn't figure out why our bedroom window frames were dripping, including the in-law apartment beneath our bedroom, and the window near the second floor bath, but no other part of the roof presented any leaking issues. And this is a house on the National Historic Register that was built in 1700. Anyway, one fine day, yesterday, in fact, my wife saw smoke rising form the same area of the first ice dam and voila! Both affected sections had bathroom roof vents. As a result of this sleuthing, we've decided to put up with steamy bathrooms anytime there's an accumulation of snow on the roof. Not sure about ptkillelea cost and pricing structure, but by far the most expensive part of insulating an attic properly is the air-sealing and other prep work. From a labor/time perspecitve in most attics, that and the cost of getting the truck to the site can be 80-90% of the labor hours. 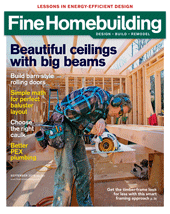 Once you're onsite, the material cost of an extra R-10 of cellulose is roughly $100/1000 s.f. 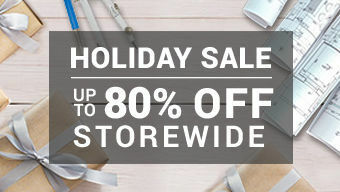 With labor less than $100. 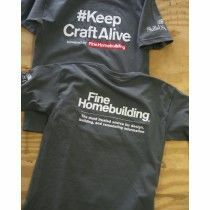 Even fully burdened with overhead and profit, adding additional insulation is cheap and easy. Again, AFTER you've done the proper air-sealing. Of course, the cost structure changes considerably if you're driving out just to add R-10. But looking at the incremental costs involved on an existing project, it isn't a waste if you fully count not just the energy benefits, but improved comfort (summer and winter), and avoiding even a single destructive ice episode. 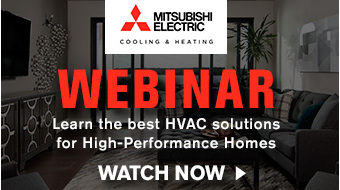 In most cases, going to R-60 isn't a waste in heating climates--and there's nothing wrong with it in cooling climates either. After doing what I thought was a good job insulating and venting my stand-alone garage this past fall, I found an ice-dam on the eave just below a skylight. In hindsight it makes sense, because the skylight causes 2 problems: 1 - heat rises into the space and melts the snow around it, and 2 - the skylight effectively blocks the ventilation in the section of roof joists that it sits within. Any suggestions on how to remedy? Mike Rogers- the R50 thing is not a cost issue, it is a function issue. The greatest insulation value comes from the first several inches of insulation, and after that, the higher up you go, the less thermal resistance you get per inch. Once you get past R50, its a waste of money because it wont work any better. Thats what i meant by "diminishing returns". Colden: I just had to smash up an ice dam at my in-laws who have a DRYER vent coming out of their roof!! Talk about melting! You and my inlaws ought to think about sidewall venting if possible. SmalltownBC: skylights not only block ventilation but they are a dam in themselves! Very thorough ice+water flashing around the whole window come springtime will help. I used an Energy Star metal roof for the New England house I built (Century Drain), and though we've had a ton of snow this winter, it's really been a non-issue. As soon as enough of it accumulates, the snow slides off the roof from its own weight. Now I understand why metal roofs are becoming increasingly popular in states like New Hampshire and Maine. 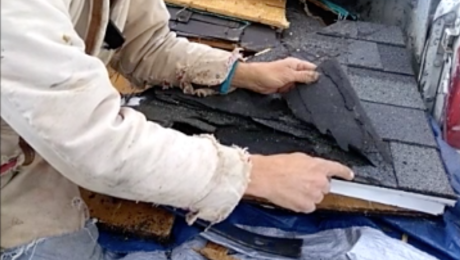 Aside from it being inexpensive and can be installed by cheap labor, I have a hard time understanding why asphalt shingle roofs are so popular in this country: they have a relatively short lifespan, they are prone to leakage, they are hot in summer, and require regular maintenance. Damn glad I live in Hawaii! Lived in New Hampshire for six years. Re-roofed and roof-raked regularly all winter long after our first ice damnnnnnn! when we were unfamiliar with the house. Thanks for finally explaining it all. BTW - metal roofing out this way costs about 4-5 times what even a high-tech, Energy Star composition roof costs. Could have something to do with why you don't see too many of them, except on high-end custom homes. 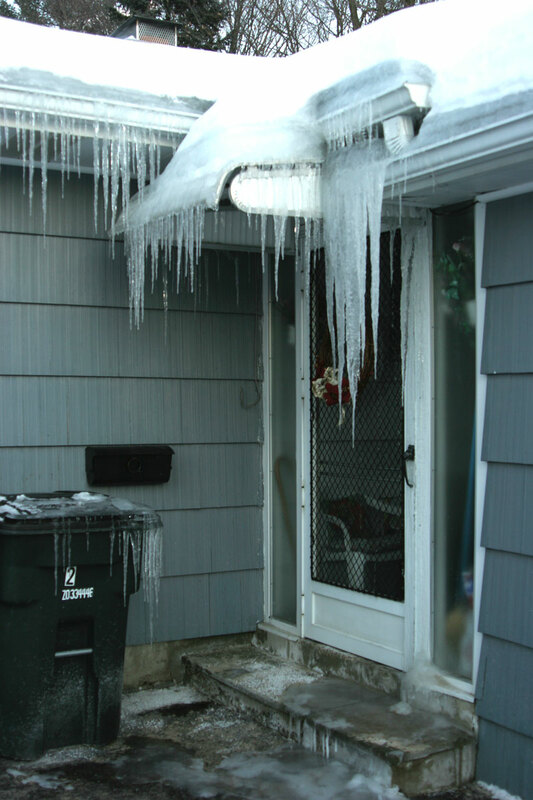 As jdaddieo notes above, we've been hammered by a series of snow and ice events in the Philly area over the past few weeks, and this sometimes leads to situations in which you get ice dams no matter how well you've insulated and air sealed the attic. 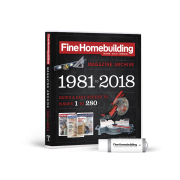 I personally spent many hours air sealing my own attic in November and early December, using the specific techniques from a FHB online video series (foam, caulk and sound sealant - you can find it with a search on the member's site). We then insulated up to about R60 with loose fill fiberglass. The snow on the roof is melting in a fairly uniform fashion (not from the top), but just as jdaddieo described, my gutter guards are freezing up enough to create a problem for the water running off the (only slightly) warmer roof. After days and days of this, you get an ice dam on the north side of the house. A recent article in another publication stated that heat cables were a bad investment, but I'm seriously considering them for next year just to keep the top of the gutters, the gutters themselves, and the downspouts clear. Thankfully these ice dams haven't caused damage, but they are producing numerous icicles, and I cant' figure out any other way to stop them. Ideas welcome! I have to jump in here because I corresponded back in October to Martin over my new roof. (Martin, I never got to have exposed rafters because "She who must be obeyed" didn't want them.) Anyhow, I went with a "warm" deck design with some modifications. New rafters, 6 inches solid foam below, 3 inches solid foam on top. This was dictated by the realities of the 200 year old Post and Beam we are renovating. On top of the top foam (which is foam sealed AND taped at all joints) we have 1X4 strapping onto which the metal roof is attached. The structure is a 5 1/2 X 12 slope, so the snow doesn't slide off until a serious thaw sets in. And to lay some claim, we are in a micro climate type ski country 60 miles south of Buffalo NY - last Wednesday before the current storm that's shutting everything down the Hyway super announced at a village board meeting we already had 168 inches of natural snow (that's 14 feet) and still have more than two months to go. I feel a need to differentiate between ice dams and icicles. We no longer have ice dams. We have icicles, but ones we can deal with. The west side gets icicles at one point - below the skylight ... I lost that discussion also with "The Boss". On the east side, the icicles are along the entire edge. The roof, insulation and roofing is the same so I'm not sure what to think yet, but the icicles form as the snow on the roof slides forward and freezes in front of the edge of the roofing. I've heard that R-value is an indication of how heat transfer is slowed down, but that there is no "perfect" insulation, that some heat loss will always occur. 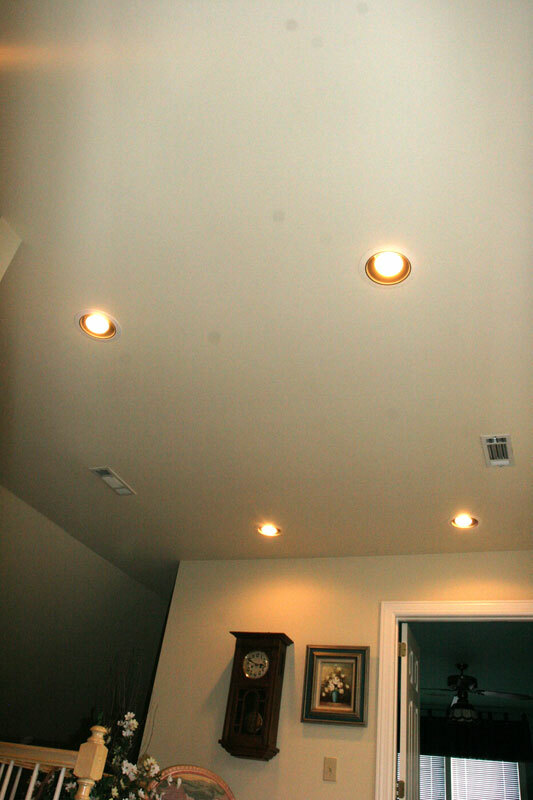 (Especially if you have R-3 skylights.) This is a simplified description ... I also have valleys, a triple wall stove stack, a dormer, etc., but NO leaks! First winter in 11 winters here, and in terms of snow and cold, a doosie. I put my roof rake away, and bought a wide shop floor type broom head which I use only to 'sweep' snow off the side porch roof - other wise it gets too high and blocks off the dormer window. From my experience, insulation works. I've heard all the claims about 'diminishing returns' ... my advice is search for recycled solid foam. I found Dow blue board at 1/3rd the price of new. The house has never been warmer, yet the wood usage and back up oil furnace cost is lower than ever, and this is a hard winter. I also differentiated above between roof deck and roofing. There is a ventilation space between the roofing and the 'structure'. 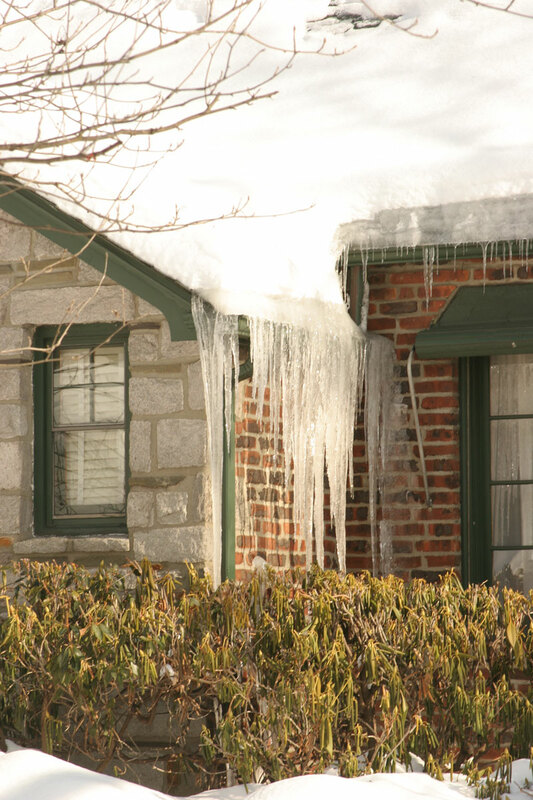 I used to have huge icicles hanging off the eaves of my 1840s home and ice buildup in the valleys. I had 3 or 4 inches of the 2 pound closed cell foam sprayed directly to the roof deck, over the top wall plates and on the gable walls and my problem was solved. It's not so much about the R value as it is about the permeability. A few inches of closed cell foam should outperform a full bay of open cell foam because the air and moisture absoultely will not travel through it. Closed cell is both an insulation and a vapor barrier so it does double duty. Technically I only have around R 18 or 20 on my roof deck, but any snow that falls stays on my roof, even the south facing side, while the snow immediately melts off my neighbors circa 2000 house. also, I have become very diligent on making sure the gutters are clean to make sure when it is above freezing, the water flows well and the gutters empty out. We live in Michigan and have had very good luck the last few years; no ice dams, no icicles, no leaks, affordable heating bills, etc. I would not Rake roofs!! The roof rake sellers are making a fortune ,so will your roofer.If you Rake your roof you are actually creating a bigger and more costly problems. 1. The Shingle manufacturer will void any warranty associated with the shingles because you are basically scraping off the sand on the shingles into your gutters!Thus wrecking the shingles. They won't claim any responsibility for the damage,and their right! 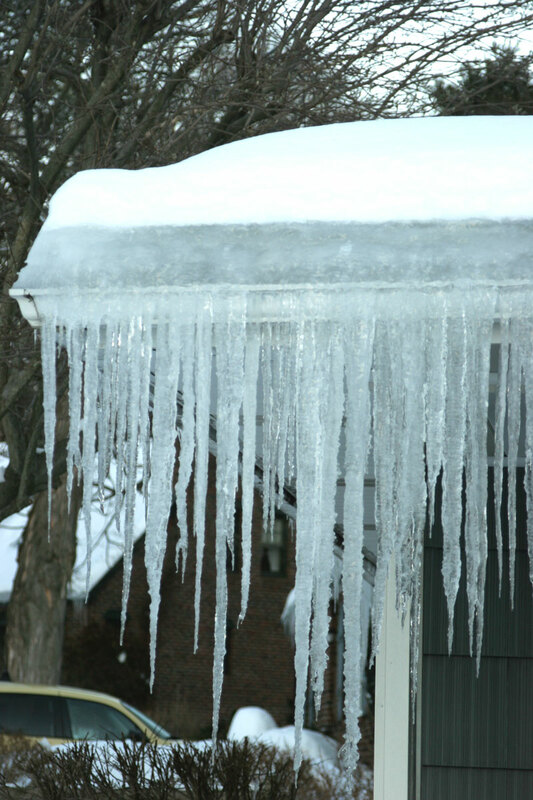 2.You are actually causing worse Ice dams.Now without the snow on the shingles,your giving Ice a great chance to freeze and thaw out working its way under your shingles thru the nail holes and into your ceilings. Properly prep your attic and insulate.Make sure if your getting a new roof everything is vented out and your roofer is installing proper venting and ice and water guard.Alot of them aren't installing Ice and water guard at all or just doubled up tar paper. We've had plenty of experience up here with this and have have plenty of evidence to prove it! The greatest insulation value comes from the first several inches of insulation, and after that, the higher up you go, the less thermal resistance you get per inch. Once you get past R50, its a waste of money because it wont work any better. Thats what i meant by "diminishing returns"
I'm so tired of reading posts from people that have no idea what diminishing returns meens. 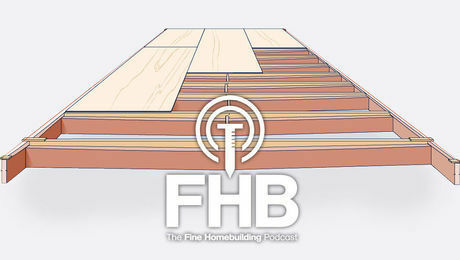 It is foolish to say that if you have 10 inches of a given insulation that the next 5 inches of the same insulation you add beside it has less thermal resistance per inch. Thermal resistance (given that there is no bridging) is a linear relationship with the thickness of material, end of story. The heat flux through a unit section of your wall can be calculated by the thermal conductivity constant of the insulating material, multiplied by the temperature difference from one side of the wall to the other, devided by the thickness. If you understand math, you can see that you can cut the heat flux in half by doubling the thickness. Lets say this just cut your heat bill from $2000 to $1000. 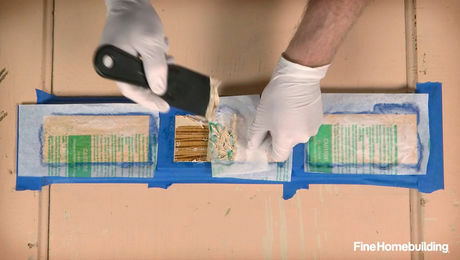 To cut the bill in half again, meens only saving $500, but you need to add twice as much insulation as you did the first time because the thickness would be four times what you started with. That is diminishing returns. Last year we bought a 100 year old house with a 3rd unfinished story. During the remodel we pulled up all the douglas fir board covering the 3rd story floor. We sold the douglas fir for $6200 for 900 square feet. We then sucked out all of the rock wool, sprayed exposed area with a layer of expanding form, filled the rest of the void with blown dense packed fiberlglass, recovered the area with plywood, and added a layer of 3 inch poly iso. To round out the project I installed 3 whirly bird vents and leave the windows on this level cracked 2 inches in the winter. 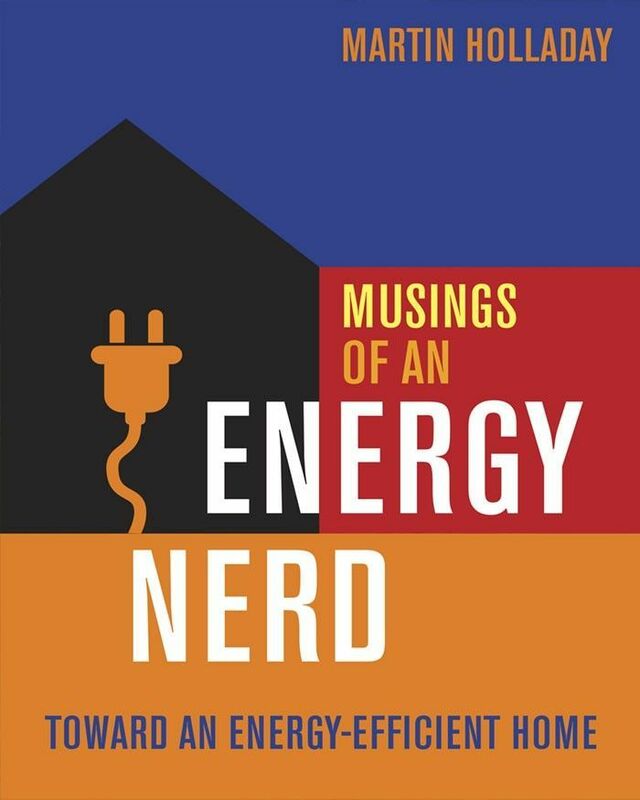 30% energy savings, no ice dams, and we swung a $2500 profit.